Whilst it might not be at the very top of your list, getting the best mustache wax for you is important. They vary greatly in thickness and longevity, so it’s important you know what the top brands are available right now. That’s where we come in. We’ve compiled a short list of our 3 favorite mustache waxes on the market, so you don’t have to waste time looking. Behind every great man is a great woman. And in front of every mans face, is a great mustache. I think that’s how the phrase goes, anyway. Whilst it isn’t a custom to have a mustache to make you a man, it can certainly add a masculine quality to your appearance. If bold and strong is the look that you are going for, then a good mustache might be worth considering. EVERY DAY STRENGTH: Our medium hold is strong enough for everyday use. Touch up on the go. PREMIUM INGREDIENTS: Safe, natural, nothing hidden, no petroleum. Ingredients listed below. NO WORRIES GUARANTEE: We offer a full refund or replacement if a product or scent is not what you were expecting. Just contact us directly and we'll get you taken care of. Whilst there isn’t much between the waxes that I’ve listed, I like the Can You Handlebar one as my favorite for a few reasons. Of course, this verdict is primarily dependant on what you’re looking for in a mustache wax. For me, I like to have a mustache wax that I can rely on to last the entire day (this is why I opt for a wax as opposed to oils, as I prefer the firmness of a wax. This is one of the firmest holding waxes around, so you don’t need to worry about carting your wax around with you to reapply it several times. Another must for me is natural ingredients. 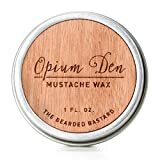 This mustache wax is made from primarily beeswax and lanolin, which is the standard – though some mustache waxes use petroleum jelly, which I dislike. Have a look at this article on why you should avoid petroleum jelly in your products. Probably the best thing about this one if that you only need a tiny pea sized scoop to last you the whole day, which makes it fantastic value for money in my eyes and a cert for the best mustache wax you can buy. Woodsman Mustache Wax is another great option if you want a manly smelling wax that will keep your ‘stache firm. Whilst it’s has a faint woodsy scent, it isn’t overpowering and it’s a good option if you don’t like a strong scent wafting up your nose. This is another mustache wax that’s made completely from natural ingredients, including cocoa butter and jojoba oil. Woodsman mustache wax is almost certainly better for people with a darker mustache rather than lighter due to the thick texture of the wax, which makes it less suitable for light mustaches (blonde and gray). This is a great choice for an effective mustache wax that will undoubtedly get the job done. We took our famous Stache Wax and made is even easier than before to make sure your lip sweater is prim and proper any time you desire! Now available in a more compact, easy to carry chapstick tube. Wild Willie's Stache Wax is created with the finest Organic Natural ingredients on the market. We blend 7 of the most powerful butters, carrier oils, vitamins and essential oils to give you the best Wax you could ask for. Our wax not only gives you a firmly held mustache, but also treats it at the same time. All our products are Hand Made (just like in the old days) in Georgia-USA. We do NOT use Chemicals, Preservatives, Fragrances, or Colorants in any of our products. Wild Willie’s is definitely one of our favoured mustache waxes to use. Whilst the other recommendations in our list will work perfectly fine, we like Wild Willie’s that little bit more for a few reasons. Firstly, the ingredients. It’s a great blend of various organic ingredients. You can tell that there is a good amount of Shea butter in the blend, as this wax is slightly softer than what you might expect if you have used other waxes in the past. This doesn’t affect its strength once applied though; in fact, we found Wild Willie’s to hold our mustache in place better than any other. The great organic ingredients like shea butter, pine resin and various different oils give this mustache wax a great smell (slightly pine-y, due to the resin). It isn’t overwhelming like some other waxes and oils that we have used, though. The main thing that we prefer about this mustache wax over others (we used Firehouse for a long time) is that it is ridiculously smooth. It doesn’t clump up at all, which is often the case with other waxes. This wax is easy to apply and does the job well, which is why we’ve named it one of our favorite mustache waxes. If even the Wild Willie’s organic wax is too firm for you, then this Fisticuffs wax would be a good option. 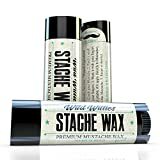 It’s perhaps the softest wax on the market right now, which would be a good choice for anyone who can’t stand the thick nature that is associated with regular mustache wax. Fisticuffs are one of the original brands that started making mustache wax, and their products have stood the test of time pretty well. Whilst this is their most popular product, they also have various other waxes and oils that you might want to check out, too. Not just for your mustache, but they make them for your beard, too. Have a look at more tips and beard trimmers here. 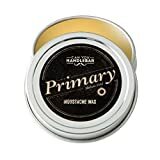 One of the more popular mustache wax’s on the market right now, Wacky Tacky is especially targeted at men with finer facial hair. This means that if you aren’t yet sporting a full, thick mustache, this would be a good option as it binds the hair together and creates a fuller appearance. Upon applicaton, Wacky Tacky will appear to be a little bit darker than some of it competitors. This isn’t an issue though, as after it’s applied, the darkness of the wax disappears and this isn’t an issue. If you are looking for a good, thorough wax that won’t let you down, Firehouse could be a great option for you. Whilst getting a good quality mustache wax is the most important thing, it’s all for nothing if you don’t apply it properly. Don’t worry; it isn’t rocket science. But, there are a few steps you need to follow. Scoop a small, pea-sized portion of wax onto your fingers. Don’t worry if you think the wax is too hard; this is normal. If needs to, you can rest it on the radiator or hair dry the wax for a few seconds to warm it up. Massage the wax into your fingers slightly to help warm the wax up and enable a good spreadability. This is essential to help avoid clumps of wax getting stuck in your mustache. Apply the wax, ideally from the center outwards towards the tips of the mustache. This way, you can keep with the natural growth and direction of the mustache, which is important. That’s it! Your mustache should be okay, as long as you’ve massaged the wax in properly. If necessary, you can use a comb to help straighten the mustache, though this is only necessary for longer styles. There are numerous means that improve the process of growing a thick mustache. Unfortunately, most people are just born with the genetics in such way that the only thing they need to do is let the time pass by and take care of it. For the ones who are not embraced with such genetics, growing a thick mustache is something very challenging. Anyway, in most cases the one and only thing that men need to do to grow a mustache is to have patience and let the body take care of it’s own. While this happens, they need to help the body as much as they can by providing a good environment. A good body environment reflects on the way in which a man takes care of him, by keeping a clean face, by having enough hours of sleep, a good healthy diet and low levels on stress. This happens to be extremely important in the process of growing a thick mustache because these things can affect directly the body as the alcohol affects the liver. To grow a mustache you have to keep a clean face, you have to clean it daily with warm water instead of standard soap. This is recommended because the standard soap can be very abrasive and damaging to the skin. Instead, you can use a special moisturizing facial lotion to keep the skin hydrated during the day. Another reason that affects the process of growing a mustache is the amount of sleep taken at the end of a day. Getting between 6 and 8 hours of sleep every day is very important not just in the process of growing a mustache but in general, to keep your mind healthy and rested. This also keeps a very low level of stress during the next day. By keeping a healthy life and a strong body, the process of growing a thick mustache becomes easier and of course, to help speed up the process specific lotions can be used. These lotions are recommended by dermatologists to contain coconut oil, rosemary essential oil, cinnamon powder or lemon juice because it speeds up the process of growing facial hair. As a conclusion, growing a thick mustache it’s something natural and in most cases time is essential. Taking care of your body and mind will help the process of growing a mustache from all perspectives.